In the future, all heating systems will have integrated solar energy. But you can have it now. Adding the ÖkoFEN Pellesol solar collector to the other components of our ecologically orientatedproduct range makes perfect sense. The specially coated aluminium absorber surface on the Pellesol collects the energy from the sun and stores it as heat in the accumulator tank. Whether you opt for on-roof installation of solar collectors or choose close integration with your roof structure, ÖkoFEN can provide you with an attractively designed solution, built to the highest quality. Make the most effective use of the sun’s free energy and enjoy substantial savings on your heating costs. In the summer and whenever there is plenty of sunlight solar energy can meet almost all of your hot water and heating requirements. The sun is an inexhaustible energy source. The radiation from it hitting the earth's surface every year corresponds to a thousand times the world's energy needs. Unlike fossil fuels such as coal, gas, crude oil and uranium, it is unaffected by market speculation and available in unlimited quantities for billions of years. The Pellesol collector is perfectly suited to domestic hot water heating, but it can be used just as well for supporting your central heating system. ÖkoFEN Pellesol installations are supplied with an easy-to-use, robust assembly system made from aluminium and stainless steel and designed to match the finish on the collectors. Our system guarantees swift and secure fitting that will maximise the service life of the entire system. In a detached house, an estimated collector surface area of 1.5 m2 is required per resident for domestic hot water heating. This allows 60% of the annual DHW demand to be met by solar energy. 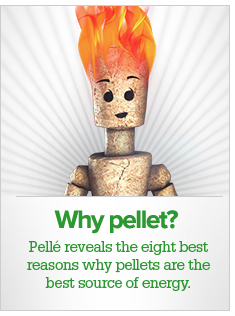 The remaining 40% is provided by the pellet boiler. For a detached house accommodating a family of four, with a roof pitch of 40° and orientation of 30° west, the calculation is as follows: 4 x 1.5 m2 = 6 m2 total collector surface area. A south facing roof surface is ideal for achieving maximum efficiency from solar collectors. However, in principal, any unshaded surface can be suitable. Facade surfaces facing anywhere between south east and south west can also be considered. Where the orientation of the roof or wall is not ideal, a lower yield can be compensated for by increasing the total surface area of the collectors.